If youâ€™re heading to Hidden Valley Country Club for the inaugural Patty Sheehan and Friends Legends Tour tournament, June 2 â€“ 5, youâ€™ll want to make sure youâ€™re prepared. Official tournament play is June 4 -5 with the first tee time at 9 a.m. each morning. Consider arriving a few minutes early to getÂ your viewing spot secured. You’re welcome to bring a chair to sit in, no lounge chairs however, and accessible areas will be set up at the #9 and #18 holes. If you’d like to see theÂ final awards ceremony you’ll need to stay through the final puttÂ June 5. Tickets are required for tournament play days and are just $10, or FREE for military and youth 17 and under. Parking during the event is also free. Events leading up to official tournament play start June 2 with a menâ€™s and womenâ€™s mixed clinic at 2 p.m. for $500 per player and a free girls clinic for players 7 â€“ 18 at 4 p.m.Â Space is still available in both clinics, click for details. If you’d like to watch the Pro Am event June 3, it’s also free.Â There are twoÂ shotgun starts, oneÂ at 7:30 a.m. and another at 1 p.m. That same evening at 6 p.m. you canÂ attend Pattyâ€™s Party at the Hidden Valley Country Club Pool. The evening is a no-host reception with a raffle, silent and live auction to benefit the Patty Sheehan Foundation. 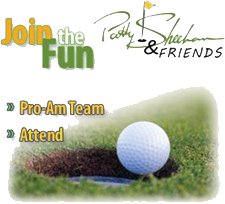 Proceeds from the Patty Sheehan and Friends Legends Tour tournament benefit the newly-formed Patty Sheehan Foundation supporting local nonprofits including Step 2, First Tee of Northern Nevada and CAAW. Get complete details.